Twitter removed “suspected users” from their platform during the week of Nov 1, 2018. This is potentially about 2.4 Million handles. Given our interest in analyzing political accounts in India, we were keen on analyzing how much of this affected the Indian political scenario. We found a large number of handles losing followers. Lets look at some of the handles which lost large numbers of followers because of this removal of suspected users. The handle @KirenRijiju had 599K followers on Nov 7, 2018 and it had 475K followers on Nov 8, 2018. The handle lost about 124K followers in one day. Below is a graph showing this in more detail. @byadavbjp had 309K followers on Nov 7, 2018 while it had 228K on Nov 8, 2018. This handle lost 81K followers because of twitter deleting suspected users. Below is the graph. @ianuragthakur handle had 1.28Million followers on Nov 7, 2018 while it had 1.26 Million the following day. This handle lost 20K followers. Graph below. We analyzed all these handles closely to see these differences in followers. Out of all the handles we are analyzing, about 40 of them have slightly larger drops in the followers. You see all the 40 handles together on the Dashboard URL. We continue adding different analyses on our Dashboard. Now you can search (see image below) for a handle in the portal to find their activity in terms of followers, followings, and tweets. We also saw sharp increase in some political handles roughly during the period 30 Sept – 14 Oct. For @narendramodi and @RahulGandhi we found steady increase of followers, while the decrease on Nov 7, 2018 was 100K followers and 10K followers respectively. Stay tuned for more analysis! We are collecting data for 925 handles. 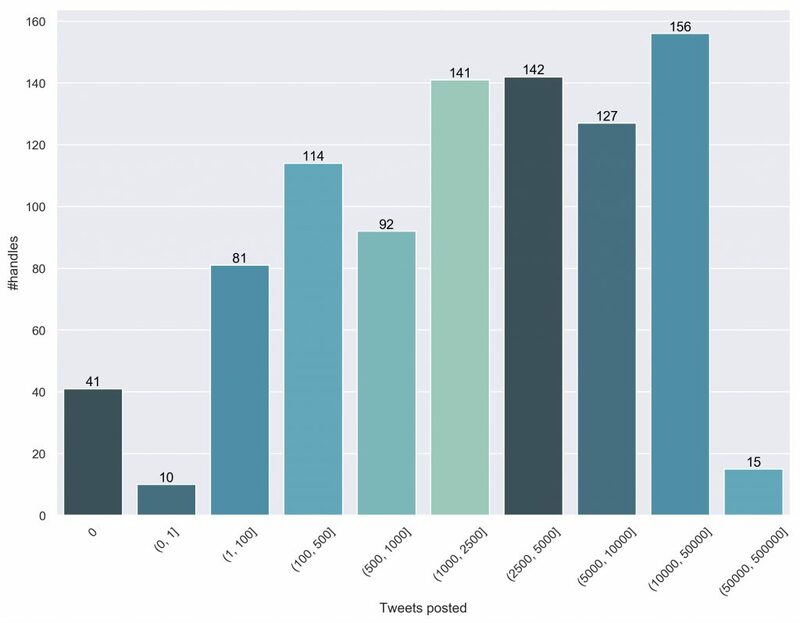 Below is the histogram / distribution of number of tweets per handle. We see 41 handles having 0 tweets and 90 handles having less than 132 tweets on their timeline. See below for detailed distribution of tweets vs handles. If you have any questions for us to answer, please drop an email at pk[at]iiitd[dot]ac[dot]in we will be happy to answer it for you and credit the same for you.